The question whether a profession of an IT developer profitable or not is continued to be important for a lot of time. Every year, it becomes a relevant subject of study for many statistical centers around the world. In this article you will learn in which countries this profession is valued the most. We have prepared statistics, graphs and survey results for you to make sure that the data is true. Well, let's start. The work of IT professionals is highly valued in the USA. Powerful, popular and responsible companies offer an average salary of 90-92K $ per year. In second place, after the United States, is Switzerland. There, such employees receive from 85-86K $ per year. The third place is occupied by such countries as Israel, Norway and Denmark. The average salary for IT workers in such national companies will be 70K $ a year. While the companies of Great Britain, Germany and Sweden will pay such an employee from an average of 53 to 50K $ a year. Programmers working in Finland or the Netherlands, receive less, from 47 to 51K $ a year. And IT workers in France have an average salary of 44K $ (see the statistics). 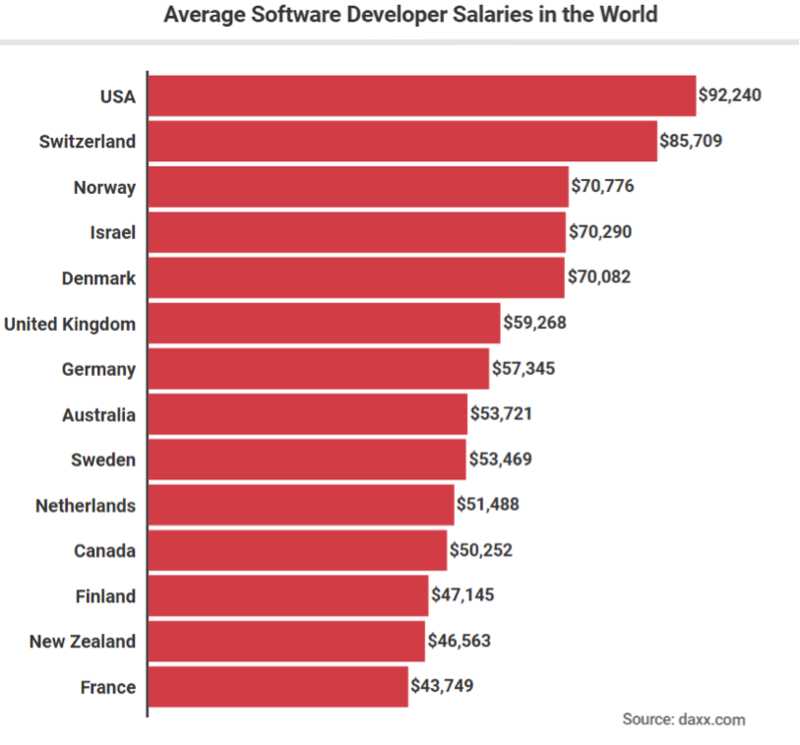 To present this in perspective, the average salary of a software programmer in Ukraine, where we build, support and keep software development teamsfor our clients, fluctuates around the $ 27,000. Keep in mind, however, that the actual annual income of Ukrainian software engineers can be much lower, and also significantly higher than the national average, depending on the city in which they live, their technical stack and the level of experience they possess. A huge factor affecting the salary of IT workers is their professional level and work experience. There are some salary thresholds in each of the countries we have listed. That is, an entry-level programmer will have the lowest salary, and a senior software developer with an excellent resume will have the highest salary. We provide a chart in which the first yellow column is the smallest salary, and the second red is the highest salary. 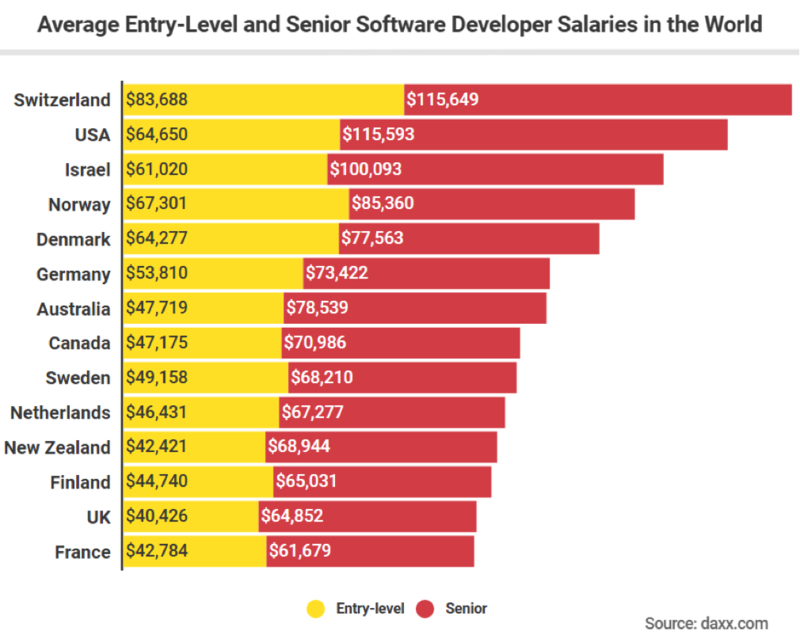 You see that senior software developers have really high salary in Switzerland ($ 115,649), then in the USA ($ 115, 593). Israel takes a third place, and the highest salary for senior IT-worker is $ 100K. The rest countries have lower salary. The results you can see in the statistics chart.